Pleural fibrosis is a misunderstood disorder which can cause severe restrictive lung disease with high morbidity and even mortality. The condition can develop in response to a large variety of diseases and tissue injury, among them infectious disease, asbestos, drugs, and radiation therapy. There is no efficient treatment to reverse established pleural fibrosis. TGF-β1 is suspected, even if not proven, as a key cytokine in this process. In this study, we used adenoviral gene transfer of TGF-β1 to the pleural mesothelium in rats. We show that local and transient TGF-β1 overexpression induces homogenous, prolonged, and progressive pleural fibrosis without pleurodesis, associated with severe impairment of pulmonary function. We further demonstrate that pleural fibrosis can expand into the lung parenchyma from the visceral layer, but not into the muscle from the parietal layer. We provide evidence that matrix accumulation and fibrosis within the parenchyma evolved through a process involving “mesothelial-fibroblastoid transformation” and suggest that the pleural mesothelial cell may be an important player involved in the development of the subpleural distribution pattern known to be a hallmark of pulmonary fibrosis. This new model of pleural fibrosis will allow us to better understand the mechanisms of progressive fibrogenesis, and to explore novel antifibrotic therapies in the pleural cavity. Pleural fibrosis can cause severe restrictive lung disease. It is usually considered as a complication of other disorders involving the chest cavity. Pneumonia, with parapneumonic effusion and empyema, tuberculosis and asbestos are among the most common causes for pleural fibrosis (1). Furthermore, numerous drugs can contribute to the development of pleural fibrosis, the best known being ergot drugs, cytostatic agents, and thoracic irradiation (Refs. 2 and 3 , and www.pneumotox.com (“The drug-induced lung diseases”)). Other potential reasons are systemic connective tissue disease, hemothorax, and progressive postthoracotomy scarring after coronary bypass (4). Depending on disease severity, pleural fibrosis can compromise respiratory function, markedly impair quality of life, and can be associated with high morbidity or even mortality. There is no effective therapy to reverse established pleural fibrosis. The pleura is a metabolically active membrane involved in maintaining a dynamic homeostasis of fluid within the chest cavity. The homeostasis is important for the mechanical properties of chest wall and lungs, and a breakdown of the fluid balance can lead to pleural effusion and ultimately fibrosis (5, 6). Pleural fibrosis can be defined as excessive deposition of matrix components resulting in the destruction of regular pleural tissue architecture. The disorder can manifest itself as discrete localized lesions (pleural plaques) or diffuse pleural thickening (5). Most research related to pleural scarring concerns the induction of pleurodesis as an approach to treat chronic effusion associated with metastasized cancer (7). Animal studies have shown that TGF-β plays an active role in pleurodesis as well as in pleural fluid formation (8, 9, 10, 11, 12). TGF-β is a multifunctional cytokine critically involved in the pathogenesis of fibrosis through its potent effects on fibroblast differentiation, extracellular matrix formation (13, 14), and epithelial-to-mesenchymal transition (EMT)3 (15). Peritoneal mesothelial cells may undergo mesenchymal conversion (16, 17) and TGF-β1 gene transfer to the peritoneal mesothelium induces peritoneal fibrosis with evidence of mesothelial-to-mesenchymal transition or “mesothelial-fibroblastoid transformation” (MFT) (18). In this study, we used transient transfer of the active TGF-β1 gene by adenoviral vectors to the pleural cavity and mesothelium. We demonstrate that this approach induces homogenous, prolonged, and progressive pleural fibrosis without pleurodesis, associated with severe impairment of pulmonary function. This new model of pleural fibrosis will allow us to better understand the mechanisms of progressive fibrogenesis, and to explore novel antifibrotic therapies in the pleural cavity. We further show that pleural fibrosis, through a process involving MFT, can expand into the lung parenchyma from the visceral layer, but not into the muscle from the parietal layer, suggesting that a distinct local environment is required for progressive fibrotic responses in the tissue. We used AdTGF-β1223/225, an adenovirus construct with a mutant TGF-β1 translated into spontaneously bioactive TGF-β1, AdLacZ (coding for β-galactosidase), and AdDL (control vectors) with no insert in the deleted E1 region for the experiments described. The construction of adenoviral vectors is described in detail elsewhere (19, 20). Female Sprague-Dawley rats (Charles River Laboratories) weighing 200–225 g were housed in special pathogen-free conditions. Rodent laboratory food and water were provided ad libitum. The animals were treated in accordance to the guidelines of the Ministère de la Recherche et de la Technologie (Paris, France). All animal procedures were performed with inhalation anesthesia with isoflurane (TEM). A total of 1.3 × 109 PFU of AdTGF-β1, AdLaCZ, or AdDL were administered in a volume of 800 μl of NaCl 0.9%, without any surgery, by intrapleural injection on the right side (sixth space) with a 20-G needle, animals in a left lateral decubitus position. For coadministration experiments, rats received, in 800 μl of 0.9% NaCl, 1 × 109 PFU AdLacZ plus 1.3 × 109 PFU AdTGF-β1 or 1 × 109 PFU AdLacZ plus 1.3 × 109 PFU AdDL. Rats were euthanized by abdominal aortic bleeding at days 4, 7, 14, 21, and 64 after adenoviral administration. After slight incision through the diaphragm, 2.5 ml of 0.9% NaCl were injected in the pleural space. The pleural lavage fluid (PLF) was retrieved with a 1-ml needle and maintained on ice until further processing. A canula was then placed into the trachea, the lungs were removed en bloc and bronchoalveolar lavage (BAL) was performed as previously described (21). Six milliliters of NaCl 0.9% was slowly injected intratracheally, retrieved, and maintained on ice. The lungs were connected through the canula to a column filled with 4% formalin with a constant pressure of 20 cm H2O for 10 min. The total volume of formalin required to inflate the lungs was considered as an estimate of total lung volume. Lungs, diaphragm, and chest wall were placed in 4% formalin for 24 h.
PLF and BAL fluid (BALF) were centrifuged at 2500 rpm for 15 min. After removal of cell and debris pellets, supernatants were stored at −80°C until further use. The pellets were resuspended in 1 ml of 0.9% NaCl. Cytospins (200 μl, 300 rpm, 2 min) were done in a cytocentrifuge (Cytospin 4; Thermo Shandon) and stained with Giemsa (Sigma-Aldrich) for differential cell count. Active TGF-β1 was determined from BALF and PLF supernatants using an ELISA kit for human TGF-β1 (R&D Systems), performed according to the recommendations of the manufacturer. The sensitivity of this assay is 7 pg/ml. Cytochemical staining for β-galactosidase was performed on samples obtained from four animals per time point after intrapleural injection of AdLacZ, AdLacZ plus AdTGF-β1, or AdLacZ plus AdDL. After 1 h in fixative (2% formaldehyde/0.2% glutaraldehyde), fresh tissue samples were stained for 6 h in a solution containing potassium ferrous cyanide, potassium ferric cyanide, magnesium chloride, Triton X-100 and 5-bromo-4-chloro-3-indolyl-β-d-galactopyranoside (X-Gal; Sigma-Aldrich). The samples were stored in 70% ethanol and then paraffin-processed and -embedded. Five-micrometer sections were counterstained with nuclear fast red as previously described (22). Transverse sections of the lung were paraffin-embedded, 5-μm sectioned, and stained with H&E, Masson-Trichrome and Picrosirius Red or processed for collagen and heat shock protein (HSP) 47 immunohistochemistry. The primary Abs were a mouse monoclonal (COL-1) to colligin-I (Abcam) and a mouse anti-HSP47 (colligin) mAb (Stressgen; TebuBio); the secondary Abs were, respectively, a goat anti-mouse IgG biotin conjugated (Chemicon International) and a biotinylated goat anti-mouse/rabbit Ig (DakoCytomation). After peroxidase inhibition (PBS plus H2O2, 20 min), tissue sections were incubated with the primary Ab (1/50 dilution for collagen I and 1/500 dilution for HSP47, overnight at 4°C in humidity chamber). Tissue sections were then incubated with the secondary Ab (1/500 dilution for collagen-I and 1/250 dilution for HSP47, 1 h). The streptavidin-HRP complex (DakoCytomation) was applied (1/300 dilution for collagen-I and 1/500 dilution for HSP47) during 45 min at room temperature. 3-Amino-9-ethylcarbazole/hydrogen peroxide was used as chromogen substrate. Slides were counterstained with hematoxylin. For the purpose of being as distant from the intrapleural injection site as possible, we always used the left lung for histology and morphometric analysis. Dual staining with Abs to α-smooth muscle actin (α-SMA) and cytokeratin was performed using fluorescently labeled Abs. After Ag retrieval in boiling 10 mM citrate buffer (pH 6.0) for 45 min, sections were incubated with α-SMA Ab (DakoCytomation) followed by a secondary rabbit anti-mouse Ab labeled with Texas Red (Molecular Probes). Sections were stained with a FITC-labeled Ab to pancytokeratin (Sigma-Aldrich) and mounted with a 4′,6′-diamidino-2-phenylindole (DAPI) nuclear stain (Vectashield; Vector Laboratories). Negative control for immunofluorescent staining were conducted using IgG2a (DakoCytomation) control Ab substituted for anti-α-SMA or normal goat serum substituted for anti-pancytokeratin. These sections were viewed with a Leica DMR fluorescence microscope (Leica Microsystems). The pleural thickness was measured by histomorphometric measurement on lung sections stained with Masson-Trichrome (200 times). Twenty-five random measures per lung section were obtained for each animal using an Eclipse E600 microscope (Nikon). Video images were captured with a 3 CCD color video camera (Sony/Nikon) and analyzed using an image analyzing system (Archimed; Microvision Instruments). Collagen amount was analyzed on paraffin sections stained with Picrosirius Red (20 times) as previously described (23, 24). Briefly, 25 random fields for each animal were digitized under polarized transmission illumination. The percentage of emission was quantified (morphometry software from Histolab/Microvision Instruments) as a reflection of percentage collagen. Collagen intensity in the pleura was measured within a rectangle determined by a constant length (200 μm), the width depending on pleura thickness. Collagen content was expressed as the percent of emission multiplied by the surface of each rectangle. Collagen amount within the pulmonary parenchyma was measured using circles randomly disposed at a constant distance from the pleural surface (see Fig. 5⇓A). Each circle had a constant diameter of 640 μm. Circle 1 was below the pleura. Circle 2 was deeper in the parenchyma, directly underneath circle 1 in a perpendicular way to the pleura. Large vessels and airways were excluded. The collagen content within circles was expressed as the percent of emission. The hydrolytic activity of matrix metalloproteinase (MMP)-2 and MMP-9 in PLF and BAL was measured by gelatin zymography. Samples were separated by 10% SDS-PAGE containing 0.1% gelatin (Sigma-Aldrich). After electrophoresis, the gels were incubated in 2.5% Triton X-100 (Sigma-Aldrich) for 30 min and were then placed in the activating buffer (50 mM Tris-HCl (pH 8), 10 mM CaCl2, 5 μM ZnSO4, 150 mM NaCl; Sigma-Aldrich), overnight at 37°C. The gels were stained with 0.1% Coomassie brilliant blue-250 solution (Sigma-Aldrich), during 30 min at 37°C. The gels were then destained with several changes of 40% methanol and 7% acetic acid. Zones of enzymatic activity were evident as clear bands against blue background. Reference standards used were MMP-2 and MMP-9 (Chemicon International). Comparisons between the AdTGF-β1-treated group and the control group (AdDL) were performed by Mann-Whitney U test and comparisons between rats of the same group were performed by Wilcoxon test. Lungs were harvested en bloc at various time points after AdLacZ administration into the right pleural space and stained for β-galactosidase activity (Fig. 1⇓A). 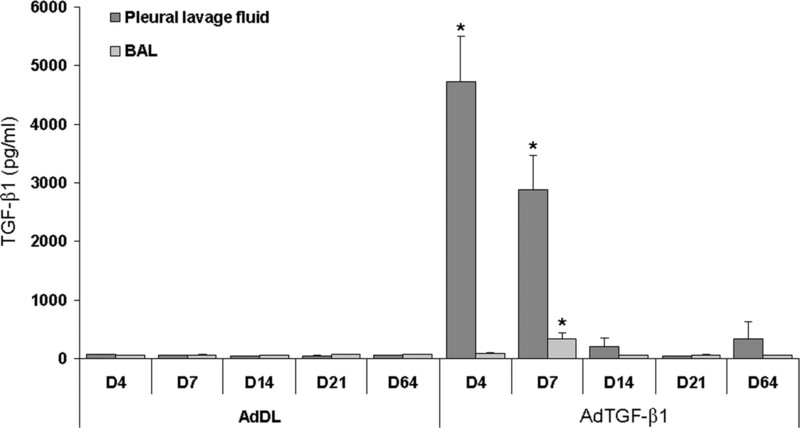 Adenovirus was highly efficient in transfecting mesothelial cells, as demonstrated by widespread expression of β-galactosidase in the visceral pleura by days 4 and 10 (Fig. 1⇓B). Mesothelial cells from the chest wall and the diaphragm were transfected as well. The transgenic protein was strictly limited to pleural mesothelial cells and was not observed within the pulmonary parenchyma (Fig. 1⇓B) or in the peritoneal cavity. Gene transfer was transient and disappeared over a period of 14 days. No β-galactosidase activity was found in control rats (Fig. 1⇓). Gene transfer was bilateral and uniform due to anatomical connections between the right and left pleural space in rodents. Adenovirus-mediated gene transfer to the pleural mesothelium is transient and limited to the pleura. 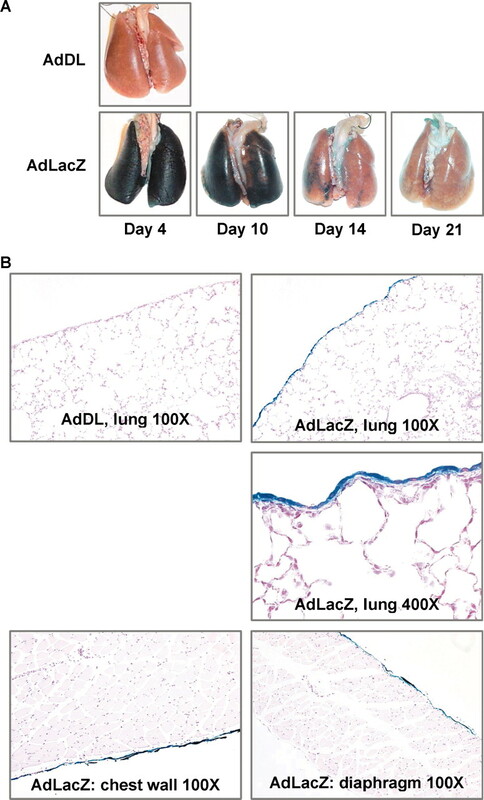 Lungs were fixed and stained for β-galactosidase activity 4, 10, 14, and 21 days after AdLacZ administration. A, Extensive uniform expression (blue staining) of adenoviral gene product was seen until day 10 but had completely disappeared by day 21. B, Four days after AdLacZ intrapleural injection, section of the lung demonstrated β-galactosidase staining limited to the mesothelial cell monolayer. Gene transfer was also effective in mesothelial cells from the chest wall and the diaphragm (chest side only). Sections were counterstained with nuclear fast red. No β-galactosidase activity was observed in control vector AdDL-treated animals (A and B); n = 4 animals per day. Rats treated with the control virus (AdDL) were healthy and steadily gained weight. In contrast, rats treated with AdTGF-β1 appeared sick with ruffled fur and lost up to 15% of body weight in the first 2 wk before recovering. Some animals had to be euthanized after AdTGF-β1 administration due to poor condition and slow recovery. These animals demonstrated fibrosis of pleura but were not included in data analysis, because they did not reach the determined endpoints. Macroscopically, the visceral pleural surface of AdTGF-β1-treated lungs appeared at any examined time point homogenously white. AdTGF-β1-treated lungs looked abnormal with shrinkage when compared with control, an observation which was progressive until day 64 (Fig. 2⇓). Interestingly, the parietal pleura on the chest wall did not look different between AdTGF-β1- and AdDL-treated rats. Adhesions were rare and blunt dissection between parietal and visceral pleura was easy. Lung volumes were assessed by measuring the volume of formalin that drained into the lungs after 10 min at a constant pressure of 20 cm H2O. Volumes were reduced by 30% in AdTGF-β1-treated lungs compared with control by day 64 (7.45 ± 0.76 ml and 10.17 ± 0.17 ml, respectively, p = 0.034). 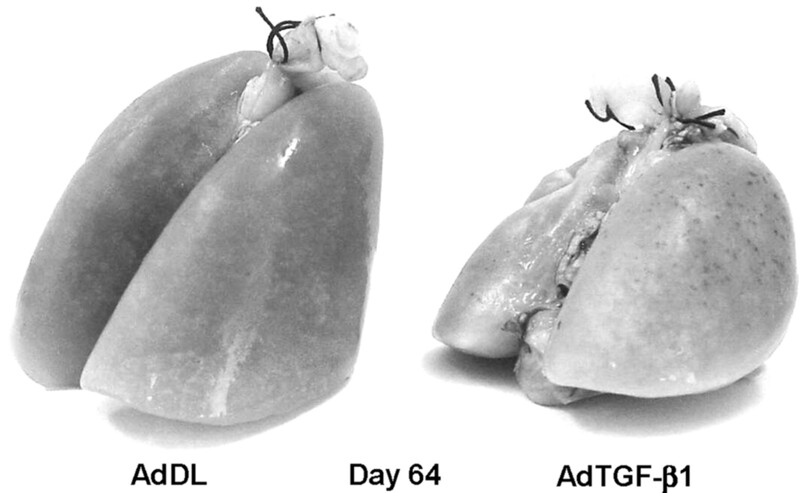 TGF-β1 pleural fibrosis is associated with a severe lung volume restriction: AdTGF-β1-treated rat lungs appeared much smaller than their controls by day 64. For inflation of the lungs from AdTGF-β1-treated rats, the volume of formalin needed at a constant pressure of 20 cm H2O for 10 min, was significantly smaller than that of control rats by day 64; p = 0.034; n = 5 AdTGF-β1 and 3 AdDL. The concentration of transgenic protein was measured by ELISA for active human TGF-β1 protein in the supernatants of PLF and BALF. 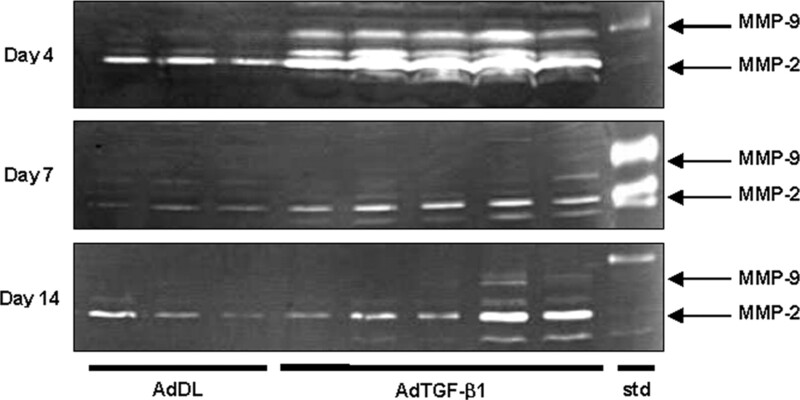 Analysis of PLF from AdTGF-β1-treated rats (Fig. 3⇓) revealed significantly increased levels of active TGF-β1 in the pleural space by days 4 and 7 (4717 ± 785 pg/ml and 2872 ± 594 pg/ml, respectively) compared with AdDL control rats (61 ± 9 and 48 ± 2 pg/ml, respectively). The transgenic product was no longer detectable after day 14. In BALF, a small increase in TGF-β1 was detected by day 7 in AdTGF-β1-treated rats compared with control (332 ± 103 pg/ml and 60 ± 1 pg/ml, respectively, p = 0.034). TGF-β1 gene transfer to the pleural mesothelium induces transient active TGF-β1 production in PLF (ELISA): a strong TGF-β1 increase in PLF was detected by days 4 and 7 after AdTGF-β1 administration but no longer by day 14. No TGF-β1 overexpression was detected in PLF from control rats. In BALF from AdTGF-β1-treated rats, only a slight TGF-β1 increase was detected by day 7. *, p = 0.034 compared with AdDL animals; n = 5 AdTGF-β1 and 3–4 AdDL per day. By day 4, we found significant pleural effusion associated with high concentration of TGF-β1 (3.3 ± 1.1 ml, p = 0.025 compared with control). The volume of pleural effusion decreased over time (1.1 ± 0.6 ml by day 7, p = 0.025 when compared with controls), and was no longer present by day 14. No pleural effusion was observed in control vector-treated animals at any time point. Total cells in PLF were increased by days 4, 7, and 14 compared with later time points, with no significant difference between AdDL- and AdTGF-β1-treated rats (Table I⇓). There was a predominance of mononucleated cells in the differential cell count (>98%) at each time point in all AdDL- and AdTGF-β1-exposed animals. No difference was observed in BALF cell count at any time point between AdDL- and AdTGF-β1-treated animals. Sections of left and right lung from the same animal were assessed by histomorphometry to compare visceral pleura thickness between both sides after intrapleural AdTGF-β1 administration (into the right chest cavity). The findings demonstrate that pleural fibrosis after intrapleural administration of AdTGF-β1 is bilateral and homogeneous (data not shown), due to anatomical connections between the two cavities in rodent lung. Consequently, we decided to perform all histomorphometric measurements on the left lung to be distant from the injection side and potential local irritation of the pleura by inflammatory cells or hemorrhage. We found that pleural thickening began as early as at day 4 and progressively increased through days 21 and 64 (Fig. 4⇓A). Similarly, the amount of collagen within the thickened pleura as assessed by picrosirius red staining (a marker specific for collagen) was progressively increased up to day 64 (Fig. 4⇓B). The pleura appeared normal in AdDL-treated rats at any time point without any indication for collagen accumulation. The parietal pleura of the diaphragm showed fibrotic changes with a uniform collagen deposition despite normal aspect on visual examination (Fig. 4⇓C). There was no fibrosis on the peritoneal side of the diaphragm. The parietal pleura of the chest wall showed even less collagen accumulation (Fig. 4⇓C). AdTGF-β1 transient gene transfer to the pleura induces a progressive pleural fibrosis. A, Four days after AdTGF-β1 administration, there was already a slight collagen deposition with a thickened pleura. The collagen accumulation was increasing up to day 64 with a thick, dense pleura and thickened alveolar wall underneath the pleura. In control rats, the pleura appeared normal with no collagen deposition at any time point (Masson-Trichrome, 200 times). HSP47 is strongly overexpressed from days 4 to 64 in AdTGF-β1-treated rats compared with control rats (HSP47 immunohistochemistry, 200 times). B, By histomorphometric measurement (collagen intensity, Picrosirius Red, 20 times, under polarized transmission illumination), the collagen accumulation within the pleura was progressive up to day 64 (bar chart). The increased thickness (Masson-Trichrome, 200 times) was sustained up to day 64 (line). n = 5 AdTGF-β1 and 3–4 AdDL per day; p < 0.01 for each day in both experiments when ADTGF-β1 was compared with AdDL rats from the corresponding day. *, p < 0.05 compared with day 4 for collagen accumulation and thickness. C, Sixty-four days after intrapleural AdTGF-β1 administration, there was a collagen accumulation on the chest surface of the diaphragm. The chest wall surface demonstrated a moderate collagen accumulation strictly limited to the surface. HSP47, a collagen-specific chaperon and closely associated with de novo synthesis of collagen, was present in the fibrotic tissue from day 4 on through to day 64 indicating an active fibroproliferative process (Fig. 4⇑A). Although fibrotic changes were strictly limited to the surface of diaphragm and chest wall and exclusively pleural, they appeared markedly different on the visceral pleura (Fig. 4⇑A). Indeed, the fibrotic changes invaded the lung parenchyma adjacent to the pleural surface (Fig. 5⇓, A and B). We measured collagen density within the parenchyma at a constant distance from the pleural surface and demonstrated that intrapleural TGF-β1 gene transfer induces a moderate but significant and progressive fibrotic response within the pulmonary parenchyma. Collagen accumulation started right underneath the pleura where it was most intense (Fig. 5⇓C, circle 1) and it increased progressively up to day 64. The amount of parenchymal collagen accumulation decreased with increasing distance from the surface (Fig. 5⇓C, circle 2) but was still progressive over time. 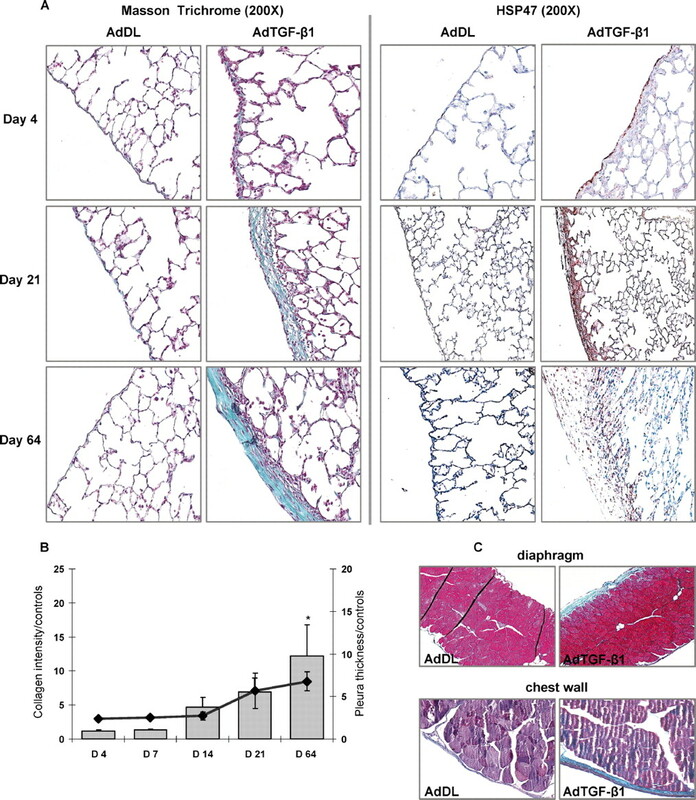 AdTGF-β1 transient gene transfer to the pleural mesothelium induces a progressive increase in collagen amount within the pulmonary parenchyma. A, Sixty-four days after AdTGF-β1 administration, collagen I (brown color) is strongly overexpressed within the pleura and within the pulmonary parenchyma (collagen I immunohistochemistry, 200 times). B, Collagen levels were randomly measured at constant distance from the pleura (Picrosirius Red staining, 20 times, under polarized transmission illumination, as shown on the picture). Each circle has a 640-μm diameter. Circle 1 is the one against the pleura. Circle 2 is deeper in the parenchyma, directly underneath circle 1 in a perpendicular way to the pleura. Large vessels and airways were excluded. C, Results are expressed as mean quantity of collagen in AdTGF-β1-treated rats reported to these of control rats (n = 5 AdTGF-β1 and 3 AdDL); p < 0.01 for each day when ADTGF-β1 was compared with AdDL rats from the corresponding day. *, p < 0.05 compared with AdTGF-β1 animals from days 4, 7, and 14. In experiments with coadministration of AdLacZ and AdTGF-β1, we observed that mesothelial cells transfected by day 0 with AdLacZ (blue staining) progressively migrated into the fibrotic tissue when TGF-β1 was overexpressed (Fig. 6⇓). The mesothelial cell layer contained abundant cytokeratin-positive cells (Fig. 7⇓, thin arrow) from day 4 to 64. By day 4 after AdTGF-β1, but not AdDL, mesothelial cells became round and lost their intercellular connection (Figs. 6⇓ and 7⇓). Seven and 14 days after AdTGF-β1, immunofluorescence demonstrated the appearance of dual-labeled cytokeratin and α-SMA-positive cells (Fig. 7⇓, thick arrow) within the fibrotic tissue. By day 64 numerous α-SMA-positive cells were observed within the parenchyma underneath the strong pleural fibrotic tissue. TGF-β1 induces mesothelial cell migration within the fibrotic tissue. After AdLacZ/AdDL coadministration, transfected mesothelial cells expressing β-galactosidase by day 6 are on a single monolayer as normally observed. After AdLacZ/AdTGF-β1 coadministration, mesothelial cells transfected by day 0 with AdLacZ (blue staining) are still localized by day 2 on a single monolayer but clearly start to change the phenotype from a flat to a more spindle like shape (please compare with Fig. 1⇑B which shows cells exposed to AdLacZ but not AdTGF-β1 at the same ×400 magnification). These cells migrate into the fibrotic tissue by day 6 when TGF-β1 was overexpressed. TGF-β1 induces phenotypic transition. Immunofluorescence from pleural sections stained for cytokeratin (green), α-SMA (red), with nuclear counterstain (blue, DAPI). The mesothelial cell layer demonstrates cytokeratin-positive cells (thin arrows) from days 4 to 64. By days 7 and 14 after AdTGF-β1, there was dual-stained cytokeratin and α-SMA-positive cells (thick arrows). By day 64, numerous α-SMA-positive cells (dotted arrows) were observed within the parenchyma. Magnification, ×400 for days 4, 7, and 14; ×200 for day 64. These phenotypical changes observed in mesothelial cells were accompanied by a strong increase in gelatinolytic activity in the pleural fluid, which is a critical factor in the process of mesothelial-to-mesenchymal transition. MMP-2 activity was markedly increased as determined by gelatin zymography in PLF from AdTGF-β1 compared with control-treated rats from days 4 to 14 and MMP-9 activity was increased by day 4 (Fig. 8⇓). TGF-β1 induces a local MMP activity (gelatin zymography from PLF): AdTGF-β1 induces an increase in MMP-2 activity by days 4, 7, and 14 and in MMP-9 activity by day 4, compared with control rats (n = 5 AdTGF-β1 and 3 AdDL per day). Pleural fibrosis is usually considered as complication of other disorders involving the chest cavity, and it is unclear why only some individuals develop progressive pleural scarring in response to injury. In this study, we show that active TGF-β1 administered to the rat pleural mesothelium by adenoviral gene transfer leads to progressive pleural fibrosis without pleurodesis, but with severe lung volume restriction. We further report that pleural fibrotic changes are associated with MFT and advance significantly into the lung parenchyma, but not into adjacent chest wall or diaphragmatic muscle. Pleural fibrosis can develop in response to a large variety of diseases and tissue injury. These are frequently but not exclusively associated with inflammation. The majority of pleural inflammatory processes resolves with treatment of the underlying cause or improves spontaneously. However, sometimes chronic scarring and fibrosis develops despite obvious resolution of the inflammatory phase (1). Progressive scarring can also occur without major inflammation, such as after surgical thoracotomy for coronary bypass (25). The trigger for switching a resolving to a progressively fibrotic tissue response in the pleural cavity has not yet been identified. Several studies have demonstrated a potential role of the growth factors basic fibroblast growth factor, platelet-derived growth factor, and TGF-β1 (26). TGF-β1 has been widely studied in the context of fibrotic diseases. This growth factor is known for its anti-inflammatory effects, is chemotactic for fibroblasts and promotes the accumulation of extracellular matrix (27). 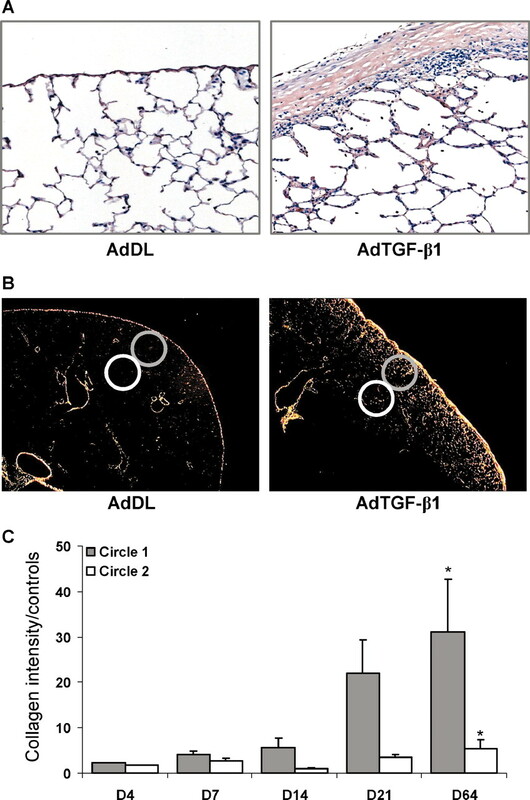 Transient overexpression of active TGF-β1 in rat lungs by adenoviral gene transfer causes progressive lung fibrosis without major inflammation, characterized by extensive deposition of extracellular matrix proteins such as collagen and fibronectin and by accumulation of myofibroblasts (20). In contrast, adenovector-mediated overexpression of IL-1β induces a severe inflammatory response in the lung followed by progressive fibrosis, likely mediated through endogenous up-regulation of TGF-β1 (21, 24). The profibrotic effects of TGF-β do not only apply to bronchial and alveolar epithelial cells but also to mesothelial cells (28). TGF-β stimulation causes mesothelial cells to synthesize excessive collagen and other matrix proteins in vitro (28). In the study reported here, we administered the gene for spontaneously active TGF-β1 into the right pleural cavity of rats and generated high levels of active protein in the pleural fluid, with peak expression between days 4 and 7. This approach resulted in severe and progressive pleural fibrosis. There was a moderate mononuclear inflammatory response to the adenovirus with no difference between AdTGF-β1 and control vector-treated rats. AdTGF-β1-induced fibrosis was progressive up to 64 days, long after the transgenic protein has disappeared from the pleural fluid. We assume that this progressive fibrogenic response is partly mediated by TGF-β autoinduction similar to what has been discussed in lung fibrosis (20). It has recently been shown that intrapleural injection of TGF-β2 stimulates mesothelial cells to produce collagen and endogenous TGF-β, further increasing the production of matrix proteins (10). Human mesothelial cells are not only able to synthesize TGF-β but also have receptors for this cytokine (11, 29), further supporting the hypothesis of autocrine activation of TGF-β in pleural fibrosis. The focus of most pleural fibrosis research is related to induction of adhesions and fibrotic changes with the clinical purpose of pleurodesis, mostly for treatment of malignant or chronic and therapy resistant pleural effusion (7). Talc and tetracycline instillation into the chest cavity are the most common approaches to pleurodesis (30). However, they are associated with significant clinical problems such as high fever and pain. Even adult respiratory distress syndrome has been recognized as a complication in up to 9% of patients receiving talc pleurodesis (31, 32). Hence, profibrotic growth factors are considered as potential alternate therapies and investigated in animal models. Lee et al. (8, 10) showed in a rabbit or a sheep model that rTGF-β2 administration into the pleural space induces initially marked fluid effusion, which is followed by effective pleurodesis with multiple adhesions. In contrast to this study, we noticed in our rat model only transient pleural effusion at very early time points, followed by progressive fibrosis of the pleura, but adhesions were almost absent (Fig. 2⇑ and 4⇑A). Both these models support a major role for TGF-β in the development and progression of pleural fibrosis, although the difference between TGF-β1 and 2 is somewhat unexpected. TGF-β1 and 2 are thought to have similar effects on the formation of matrix, but the route of administration may account for differences in the formation of adhesions (TGF-β1 through adenoviral gene transfer as opposed to recombinant protein for the TGF-β2 studies) (8, 9, 10). We believe that the technique applied for intrapleural injection may have had the most impact on the pleurodesis. Our experimental approach does not involve surgery and allows avoiding major bleeding and additional inflammatory factors which can lead to adhesions and pleurodesis (33). Finally, pleural adhesion and pleural thickening may be governed by different mechanisms. Surprisingly, the value of anti-TGF-β strategies in the treatment of pleural fibrosis and adhesions has not been investigated thoroughly. TGF-β is one of the major targets in the development of antifibrotic therapies for pulmonary fibrosis, and a number of experimental studies in animals strongly support this approach (34, 35). In our model, we induced severe and homogenous bilateral fibrosis of the visceral pleura, leading to significant restriction of lung volumes. Pleural fibrosis in humans becomes clinically significant with a restrictive pattern in lung function when it involves major parts of the visceral pleura. This can cause substantial morbidity and chronic respiratory failure, e.g., in asbestos lung, after thoracic surgery, or hemothorax, in drug-induced pleural fibrosis (ergots drug, previous chemotherapy for cancer, radiation therapy) or in familial idiopathic pleural fibrosis. No effective medical treatment is available for these conditions and surgical decortication is frequently required, with limited therapeutic success (1). Anti-TGF-β strategies are a promising therapeutic approach for prevention or cure these complications. One study has shown that intrapleural injection of TGF-β Abs can reduce empyema-induced pleural fibrosis in a rabbit model (11, 12). Although the role of TGF-β in other pleural fibrotic disorders is not definitively proven, we believe that our model could be very useful to further understand how to halt the progression or even cure this chronic condition. The pattern and distribution of pleural fibrosis in our model was different than expected, raising some interesting questions and hypotheses that need further exploration. Fibrotic changes were strongest on the visceral pleura, characterized by increasing accumulation of collagen by day 64. Less but still substantial fibrotic thickening was seen on the parietal pleura of the diaphragm, and only minor collagen was detectable on the parietal chest wall pleura. Although no fibrosis was seen in the muscle of diaphragm and chest wall, we interestingly found a significant increase of collagen within the pulmonary parenchyma adjacent to the pleural surface (Fig. 5⇑) which diminished with farther distance from the pleura. The presence of a strong positivity of subpleural HSP47 up to day 64 (Fig. 4⇑A) supports an ongoing fibroproliferative process at this time point (36). It may be that diffusion of transgenic TGF-β from the pleural space into alveoli immediately underneath the pleura contributed to this phenomenon. However, this would only partly explain the progression of these changes over time as the transgenic protein disappears within less than two weeks. We propose that the intrapulmonary collagen accumulation seen after intrapleural overexpression of TGF-β1 may also result from a progression of pleural fibrosis into the alveolar structure of the lungs. Subpleural fibrosis may be result of a response characteristic for the compartment lung, as Sime et al. (20) suggested earlier when intrapulmonary overexpression of active TGF-β1 in rats resulted in severe interstitial fibrosis starting centrally in the lung and eventually involved the visceral, but not parietal, pleura. Subpleural fibrosis is one of the hallmarks of usual interstitial pneumonia (37). Fibroblastic foci dominate in the earlier stages of disease, being a sign for an ongoing fibrotic process, whereas honeycombing is more indicative for advanced and “burned out” disease (38). It has just been reported that fibroblastic foci may communicate much closer with each other than anticipated. Cool et al. (39) suggest that they may even form a network of fibroblasts, a “fibroblastic reticulum” extending from the pleura to the underlying parenchyma. The interconnecting fibroblasts described by this group were not monoclonal, thus they likely result from a reactive rather than neoplastic response to tissue injury. The observation in our study fits well into this concept, and we believe that our model will be extremely useful to investigate this hypothesis in detail. Further indication for a potential modulating role of the pleura in fibrotic lung disease is the ability of pleural mesothelial cells to transform into myofibroblast-like cells. EMT is a central mechanism for diversifying the cells found in complex tissues (40). It is involved in a variety of normal physiological as well as pathological processes such as cancer progression and renal fibrosis (16, 17). Recent evidence suggests a potential role for EMT in the pathogenesis of pulmonary fibrosis (14, 15, 41, 42, 43). MFT is a similar process and has been described as a major factor in the development of peritoneal fibrosis (18). We demonstrate clear evidence that MFT occurs in our model of AdTGF-β1-induced pleural fibrosis, and that the mesenchymal cells derived through this process invade into the lung parenchyma. We did not find obvious fibroblastic foci in our model. Further research is needed to investigate whether the subpleural distribution pattern of pulmonary fibrosis may be in part related to a pleural process or involvement of mesothelial cells in this disease. In summary, we here present a novel model to examine the pathogenesis of pleural fibrosis using transient adenoviral vector-mediated overexpression of TGF-β1. The fibrotic process is progressive and interestingly invades into the subpleural zone of the lung parenchyma. This is associated with MFT, and it can be speculated that the pleural mesothelium may be involved in the subpleural distribution pattern of pulmonary fibrosis. We thank V. San Giorgio and all the team from the animal quarter for their invaluable and professional help. ↵1 N.D. was supported by the Comité de Côte d’Or de la Ligue Contre le Cancer and by the Société de Pneumologie de Langue Française. P.B. was supported by Pneumologie Développement. M.K. is a Parker B. Francis Fellow and was supported by a Career Development Award of Department of Medicine, McMaster University. P.J.M. is a Canadian Institutes for Health Research Clinician Scientist. ↵3 Abbreviations used in this paper: EMT, epithelial-to-mesenchymal transition; MFT, mesothelial-fibroblastoid transformation; PLF, pleural lavage fluid; BAL, bronchoalveolar lavage; BALF, BAL fluid; HSP, heat shock protein; SMA, smooth muscle actin; MMP, matrix metalloproteinase. Jantz, M. A., V. B. Antony. 2006. Pleural fibrosis. Clin. Chest Med. 27: 181-191. Antony, V. B.. 1998. Drug-induced pleural disease. Clin. Chest Med. 19: 331-340. Camus, P., P. Bonniaud, A. Fanton, C. Camus, N. Baudaun, P. Foucher. 2004. Drug-induced and iatrogenic infiltrative lung disease. Clin. Chest Med. 25: 479-519. vi. Huggins, J. T., S. A. Sahn. 2004. Causes and management of pleural fibrosis. Respirology 9: 441-447. Mutsaers, S. E., C. M. Prele, A. R. Brody, S. Idell. 2004. Pathogenesis of pleural fibrosis. Respirology 9: 428-440. Antony, V. B.. 2003. Immunological mechanisms in pleural disease. Eur. Respir. J. 21: 539-544. Lee, Y. C., R. W. Light. 2004. Management of malignant pleural effusions. Respirology 9: 148-156. Lee, Y. C., K. B. Lane, R. E. Parker, D. S. Ayo, J. T. Rogers, R. W. Diters, P. J. Thompson, R. W. Light. 2000. Transforming growth factor β2 (TGF β2) produces effective pleurodesis in sheep with no systemic complications. Thorax 55: 1058-1062. Lee, Y. C., C. J. Devin, L. R. Teixeira, J. T. Rogers, P. J. Thompson, K. B. Lane, R. W. Light. 2001. Transforming growth factor β2 induced pleurodesis is not inhibited by corticosteroids. Thorax 56: 643-648. Lee, Y. C., D. Malkerneker, C. J. Devin, P. J. Thompson, J. E. Johnson, K. B. Lane, R. W. Light. 2001. Comparing transforming growth factor β-2 and fibronectin as pleurodesing agents. Respirology 6: 281-286. Sasse, S. A., M. R. Jadus, G. D. Kukes. 2003. Pleural fluid transforming growth factor-β1 correlates with pleural fibrosis in experimental empyema. Am. J. Respir. Crit. Care Med. 168: 700-705. Kunz, C. R., M. R. Jadus, G. D. Kukes, F. Kramer, V. N. Nguyen, S. A. Sasse. 2004. Intrapleural injection of transforming growth factor-β antibody inhibits pleural fibrosis in empyema. Chest 126: 1636-1644. Blobe, G. C., W. P. Schiemann, H. F. Lodish. 2000. Role of transforming growth factor β in human disease. N. Engl. J. Med. 342: 1350-1358. Yao, H. W., Q. M. Xie, J. Q. Chen, Y. M. Deng, H. F. Tang. 2004. TGF-β1 induces alveolar epithelial to mesenchymal transition in vitro. Life Sci. 76: 29-37. Willis, B. C., R. M. duBois, Z. Borok. 2006. Epithelial origin of myofibroblasts during fibrosis in the lung. Proc. Am. Thorac. Soc. 3: 377-382. Yang, A. H., J. Y. Chen, J. K. Lin. 2003. Myofibroblastic conversion of mesothelial cells. Kidney Int. 63: 1530-1539. Yanez-Mo, M., E. Lara-Pezzi, R. Selgas, M. Ramirez-Huesca, C. Dominguez-Jimenez, J. A. Jimenez-Heffernan, A. Aguilera, J. A. Sanchez-Tomero, M. A. Bajo, V. Alvarez, et al 2003. Peritoneal dialysis and epithelial-to-mesenchymal transition of mesothelial cells. N. Engl. J. Med. 348: 403-413. Margetts, P. J., P. Bonniaud, L. Liu, C. M. Hoff, C. J. Holmes, J. A. West-Mays, M. M. Kelly. 2005. Transient overexpression of TGF-β1 induces epithelial mesenchymal transition in the rodent peritoneum. J. Am. Soc. Nephrol. 16: 425-436. Bett, A. J., W. Haddara, L. Prevec, F. L. Graham. 1994. An efficient and flexible system for construction of adenovirus vectors with insertions or deletions in early regions 1 and 3. Proc. Natl. Acad. Sci. USA 91: 8802-8806. Sime, P. J., Z. Xing, F. L. Graham, K. G. Csaky, J. Gauldie. 1997. Adenovector-mediated gene transfer of active transforming growth factor-β1 induces prolonged severe fibrosis in rat lung. J. Clin. Invest. 100: 768-776. Kolb, M., P. J. Margetts, D. C. Anthony, F. Pitossi, J. Gauldie. 2001. Transient expression of IL-1β induces acute lung injury and chronic repair leading to pulmonary fibrosis. J. Clin. Invest. 107: 1529-1536. Margetts, P. J., M. Kolb, T. Galt, C. M. Hoff, T. R. Shockley, J. Gauldie. 2001. Gene transfer of transforming growth factor-β1 to the rat peritoneum: effects on membrane function. J. Am. Soc. Nephrol. 12: 2029-2039. Bonniaud, P., M. Kolb, T. Galt, J. Robertson, C. Robbins, M. Stampfli, C. Lavery, P. J. Margetts, A. B. Roberts, J. Gauldie. 2004. Smad3 null mice develop airspace enlargement and are resistant to TGF-β-mediated pulmonary fibrosis. J. Immunol. 173: 2099-2108. Bonniaud, P., P. J. Margetts, K. Ask, K. Flanders, J. Gauldie, M. Kolb. 2005. TGF-β and Smad3 signaling link inflammation to chronic fibrogenesis. J. Immunol. 175: 5390-5395. Areno, J. P., J. P. McCartney, J. Eggerstedt, W. Grafton, R. B. George. 1998. Persistent pleural effusions following coronary bypass surgery. Chest 114: 311-314. Mutsaers, S. E., I. Kalomenidis, N. A. Wilson, Y. C. Lee. 2006. Growth factors in pleural fibrosis. Curr. Opin. Pulm. Med. 12: 251-258. Bonniaud, P., P. J. Margetts, M. Kolb, T. Haberberger, M. Kelly, J. Robertson, J. Gauldie. 2003. 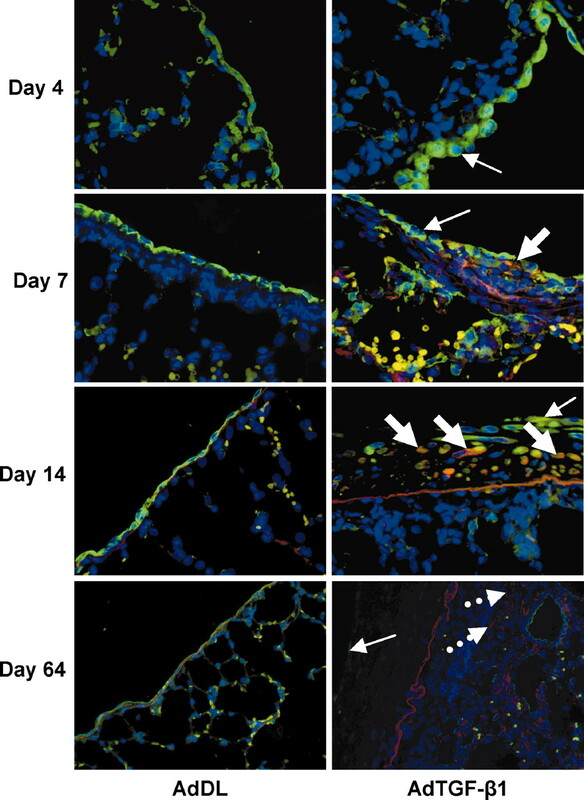 Adenoviral gene transfer of connective tissue growth factor in the lung induces transient fibrosis. Am. J. Respir. Crit. Care Med. 168: 770-778. Lee, Y. C., K. B. Lane. 2001. The many faces of transforming growth factor-β in pleural diseases. Curr. Opin. Pulm. Med. 7: 173-179. Gerwin, B. I., J. F. Lechner, R. R. Reddel, A. B. Roberts, K. C. Robbins, E. W. Gabrielson, C. C. Harris. 1987. Comparison of production of transforming growth factor-β and platelet-derived growth factor by normal human mesothelial cells and mesothelioma cell lines. Cancer Res. 47: 6180-6184. Antony, V. B., N. Nasreen, K. A. Mohammed, P. S. Sriram, W. Frank, N. Schoenfeld, R. Loddenkemper. 2004. Talc pleurodesis: basic fibroblast growth factor mediates pleural fibrosis. Chest 126: 1522-1528. Brant, A., T. Eaton. 2001. Serious complications with talc slurry pleurodesis. Respirology 6: 181-185. Light, R. W.. 2002. Talc for pleurodesis?. Chest 122: 1506-1508. Mitchem, R. E., B. L. Herndon, R. M. Fiorella, A. Molteni, C. N. Battie, G. R. Reisz. 1999. Pleurodesis by autologous blood, doxycycline, and talc in a rabbit model. Ann. Thorac. Surg. 67: 917-921. Ask, K., G. E. Martin, M. Kolb, J. Gauldie. 2006. Targeting genes for treatment in idiopathic pulmonary fibrosis: challenges and opportunities, promises and pitfalls. Proc. Am. Thorac. Soc. 3: 389-393. Bonniaud, P., P. J. Margetts, M. Kolb, J. A. Schroeder, A. M. Kapoun, D. Damm, A. Murphy, S. Chakravarty, S. Dugar, L. Higgins, et al 2005. Progressive transforming growth factor β1-induced lung fibrosis is blocked by an orally active ALK5 kinase inhibitor. Am. J. Respir. Crit. Care Med. 171: 889-898. Kakugawa, T., H. Mukae, T. Hayashi, H. Ishii, K. Abe, T. Fujii, H. Oku, M. Miyazaki, J. Kadota, S. Kohno. 2004. Pirfenidone attenuates expression of HSP47 in murine bleomycin-induced pulmonary fibrosis. Eur. Respir. J. 24: 57-65. American Thoracic Society. 2000. Idiopathic pulmonary fibrosis: diagnosis and treatment. International consensus statement. American Thoracic Society (ATS), and the European Respiratory Society (ERS). Am. J. Respir. Crit. Care Med. 161: 646-664. Noble, P. W.. 2003. Idiopathic pulmonary fibrosis: new insights into classification and pathogenesis usher in a new era therapeutic approaches. Am. J. Respir. Cell. Mol. Biol. 29: S27-S31. Cool, C. D., S. D. Groshong, P. R. Rai, P. M. Henson, J. S. Stewart, K. K. Brown. 2006. Fibroblast foci are not discrete sites of lung injury or repair: the fibroblast reticulum. Am. J. Respir. Crit. Care Med. 174: 654-658. Kalluri, R., E. G. Neilson. 2003. Epithelial-mesenchymal transition and its implications for fibrosis. J. Clin. Invest. 112: 1776-1784. Kim, K. K., M. C. Kugler, P. J. Wolters, L. Robillard, M. G. Galvez, A. N. Brumwell, D. Sheppard, H. A. Chapman. 2006. Alveolar epithelial cell mesenchymal transition develops in vivo during pulmonary fibrosis and is regulated by the extracellular matrix. Proc. Natl. Acad. Sci. USA 103: 13180-13185. Willis, B. C., J. M. Liebler, K. Luby-Phelps, A. G. Nicholson, E. D. Crandall, R. M. du Bois, Z. Borok. 2005. Induction of epithelial-mesenchymal transition in alveolar epithelial cells by transforming growth factor-β1: potential role in idiopathic pulmonary fibrosis. Am. J. Pathol. 166: 1321-1332.